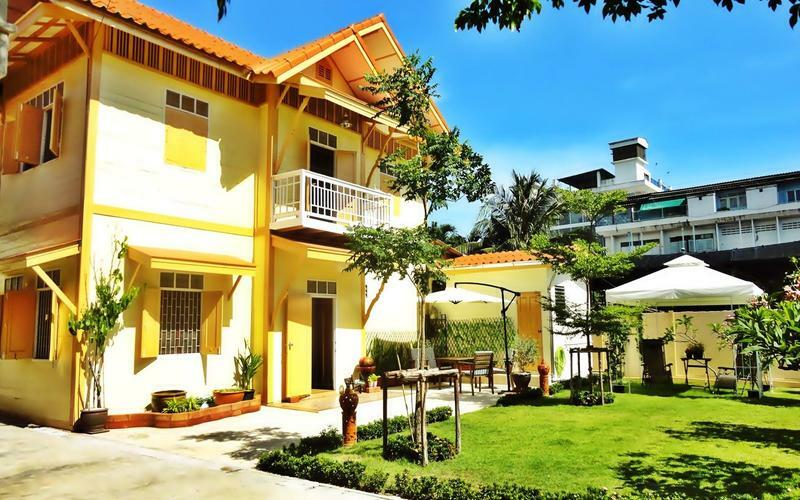 FAB Hostel Bangkok is a 10-minute walk from Surasak BTS Skytrain Station at the heart of Bangkok. It offers private and dormitory rooms with free High-Speed WiFi in all areas including bedrooms. The property features outdoor facilities including darts, badminton and table tennis. Only 2 km from night market Â« Asiatique Â» and Sky-Bar. 4 Stations to Siam, MBK and the train station (Hua-Lampong). A Shop and ATM Â« Family Mart Â» open 24/7, nearby 50 m.
You will also find a street food and the park with a free outdoor gym nearby. - Free High-Speed Wi-Fi in all the property including bedrooms. - Share Kitchen with Free Coffee and Drinking Water. - Washing Machine with Free Powder. - Free Bicycles if you want to ride around to visit the local area. - Or inside we have a living room with large screen to watch movies, Bookshelves and also board games (Cards, Poker, Chessâ€¦) Friendly and helpful staff. Our knowledge of Thailand and backpacking experience allows us to offer you all the tips you need to know to make your stay the best possible. We are here to make your trip easier and mainly make you feel at home. From the airport you can get a taxi meter about 300 baths.